"While this academic work showcases an astounding amount of research, the quick pacing and engaging language keep it from being a dry report of BRS findings. It is accessible to any reader with an interest in the convergence of paranormal beliefs and religion. The thought-provoking narrative will not disappoint experts on the topic." -Library Journal starred review "
In the mean time, I'm coming up with some great ideas for psychological tests, thesis papers, and even a questionnaire for paranormal investigators (in case I ever get the urge to form a group again). I will say, though, coming up with a psychological examination questionnaire of this type isn't a picnic. 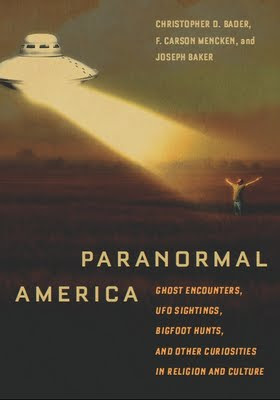 Generally, unless it's a meaningful collection of paranormal anecdotes, I steer clear of books on this topic. So much is rehash or deeply steeped in the 'kool-aid'. However, I do like scholarly works on the paranormal, usually how it relates to we humans instead of deciphering the mechanics of other realms. I feel in this arena, our best answers lie, vis-a-vis R. C. Finucane's work (which I have oft lauded) and other sociologists and psychologists. Perhaps by understanding ourselves better, we can understand these mysteries more. It is, after all, our perceptions that matter most in these cases. 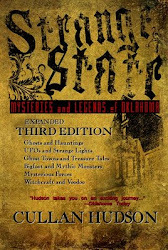 The book is less about the paranormal, per se, than those who believe in paranormal. 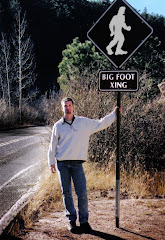 For example, the authors feature a chapter on bigfoot but it is really more about the researchers in pursuit of the creature than the creature itself. It is interesting and the authors are good guys. Thanks, Mike. The more I look into it, the more I want to check it out. I think it might be a good read. There's so little "smart" info out there on the paranormal. There is however a lot of TAPSesque garbage floating about.